The Orkney Islands, or more simply just Orkney, are a group of islands off the northern coast of Scotland. Despite being close to 60° North Latitude and off the northern coast of what is today a very lightly settled area, Orkney has a long history of human settlement. The earliest sign of human occupation is a charred hazelnut shell dated to 6820-6660 BC, found at Longhowe in Tankerness. Structures have been found going back to 3500 BC. The early people found construction relatively easy, as Orkney is largely made up of soft sandstone that readily splits into useful sheets or plates. Some of their sites have been especially well preserved by being buried under drifts of wind-blown sand. Skara Brae was a community occupied from about 3000 to 2500 BC. A stone house at Knap of Howar on the island of Papa Westry was occupied from about 3500 to 3100 BC. These Neolithic people built a number of megalithic structures before leaving around 2500 BC. The Iron Age came with resettlement by the Pictish people, who left brochs or strongly built round towers and underground dwellings like the one near Kirkwall. The Iron Age in Britain lasted from about 800 BC through the 400s AD. A Pictish King of Orkney was one of 11 British leaders submitting in 43 AD to the Roman Emperor Claudius at Colchester, following the Roman invasion of southern Britain. However, the Romans had little to do with Scotland, building Hadrian's Wall well south of the Scottish border to keep those troublesome Picts from invading further to the south. Pytheas of Massilia, now known as Marseille, visited Britain sometime between 322 and 285 BC, and referred to the northern tip being called Orcas. The Roman geographer Pomponius Mela and Roman historian Tacitus both called the islands Orcades in 43 AD and 78 AD, respectively. Mela's De Chorographia reported that there were thirty Orkney islands. Meanwhile, it seems that Orc was a Pictish tribal name meaning young pig or young boar. Celtic missionaries from Ireland and the Hebrides off the west coast of Scotland, companions of Saint Columba, showed up around 565 AD. A number of the smaller islands now have names including Papa, commemorating the missionaries' presence. Columba's biographer, Adomnan, stated that there were Orcadians at the court of the Pictish High King Bridei in 565. The Vikings were raiding the area around this time. Viking raiders made Orkney their headquarters by the 800s. They interpreted the Pictish orc as Old Norse orkn or "seal", and added -ey meaning "island". Thus Orkneyjar or Seal Islands. Harold Hårfagre, or "Fair Hair", subdued the Viking raiders and annexed Orkney and Shetland (even further northeast from Orkney) to Norway in 875. In 1468 the Norwegian king Christian I pledged Orkney and Shetland to James III of Scotland as dowry for his daughter Margaret. During World Wars I and II and continuing until 1956, the huge and well protected natural harbor of Scapa Flow served as a primary base of the Royal Navy. To get there, you could take a train as far as Inverness. Then switch to a bus for a ride of almost four hours up the far northeast coast to Thurso, and just beyond that to Thurso's harbor of Scrabster. A ferry crosses from there to Stromness, on Mainland, the main island of Orkney. Above near the center of Mainland you see The Heart of Neolithic Orkney, what has been designated as a UNESCO World Heritage Site. The pictures on the pages listed below follow the order in which I visited the sites. 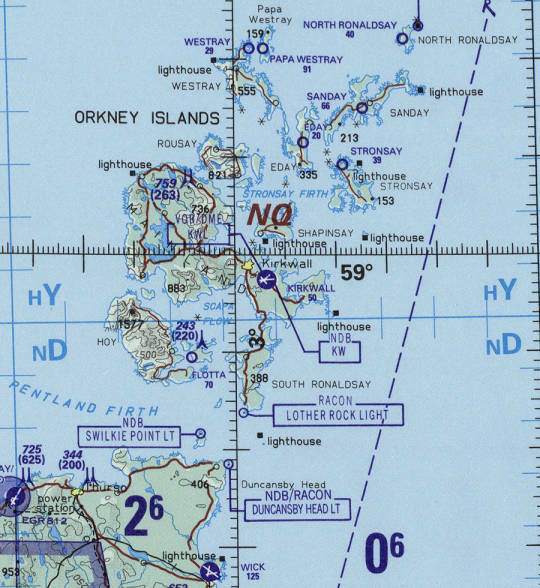 You may want something like the Ordnance Survey Explorer map #463, Orkney — West Mainland (Stromness & Graemsay) for navigation details. It's at 1:25,000 scale. 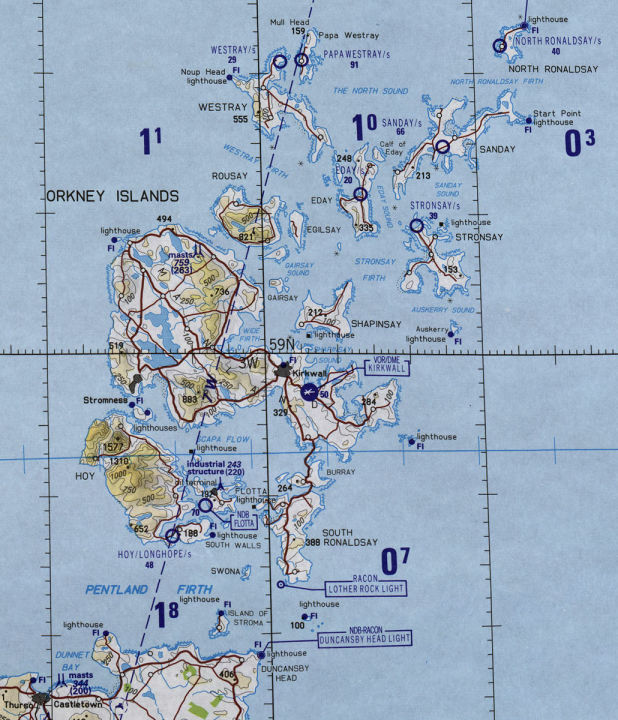 Or the 1:50,000 Landranger map #6, Orkney (Mainland). Starting in the southwest, near the lower left corner as seen here, is the Knowe of Onston. Sometimes you see Unston instead, the names are a bit ambiguous as they're derived from the old Norse place names that have been spelled erraticly in the Norse, which evolved into Norn, which then was replaced with Scots English over the past two centuries. It's labeled "Chambered Cairn" on this map. 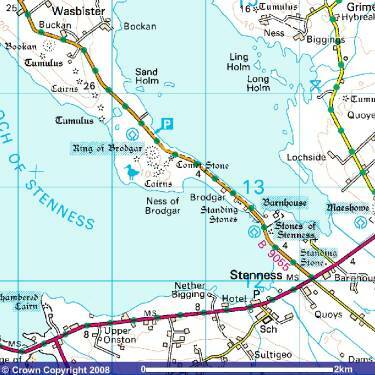 Then, follow the A 965 highway through the small settlement of Stenness (a hotel, a school, a petrol station, and a few houses), across the B 9055 road and past the Barnhouse standing stone, just off the north side of the highway. That leads to Maeshowe, a very significant chambered cairn. Next, go back to the B 9055 and go north on it to the Stones of Stenness megalithic circle and the nearby remains of the Barnhouse settlement. Continuing north across a causeway separating the Loch of Harray from the Loch of Stenness, you pass some scattered small standing stones. After a little more than a kilometer you reach the Ring of Brodgar, a very large stone circle and associated henge, with outlying standing stones, cairns, and tumuli.